This winter I’ve resolved to make soup once a week in efforts to make meals that are both lighter and able to warm the belly. So far, I’m off to a good start; first I tried this roasted root vegetable soup from the Eat Run Live Blog, and this week I tried a fabulous mushroom barely soup from Real Simple Magazine. 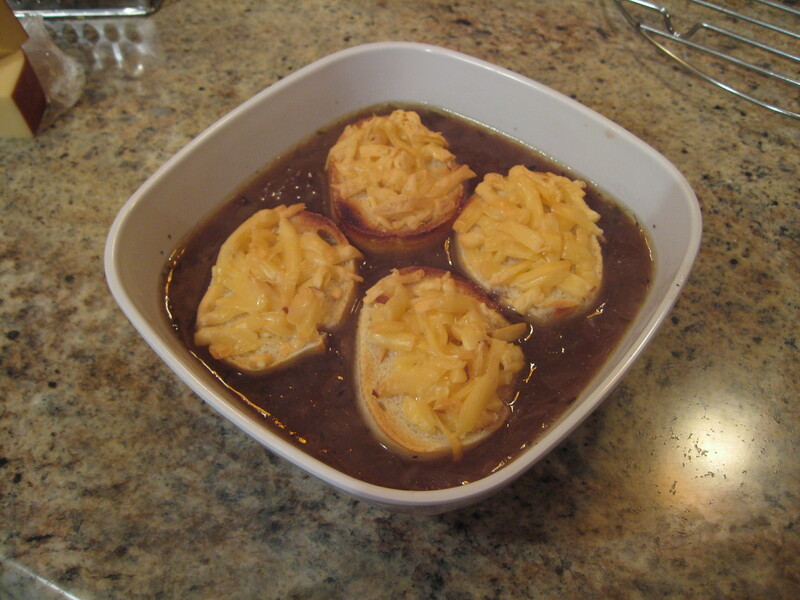 Both were excellent, but I have to say my favorite so far has been the French Onion Soup. I found this Tyler Florence recipe a few years ago, and I loved it so much the first time I made it, I made it again a week later. What I love about this recipe is the depth of flavor. It’s not just broth and onions here, there are layers of flavors. And of course there are cheesy croutons. Gotta love cheesy croutons! Before we get started with the recipe let’s talk about chopping up onions. Another reason why I like this recipe is because I am a huge kitchen nerd and it gives me an opportunity to practice my onion chopping skills. So here is my crash course in cutting onions like a pro. 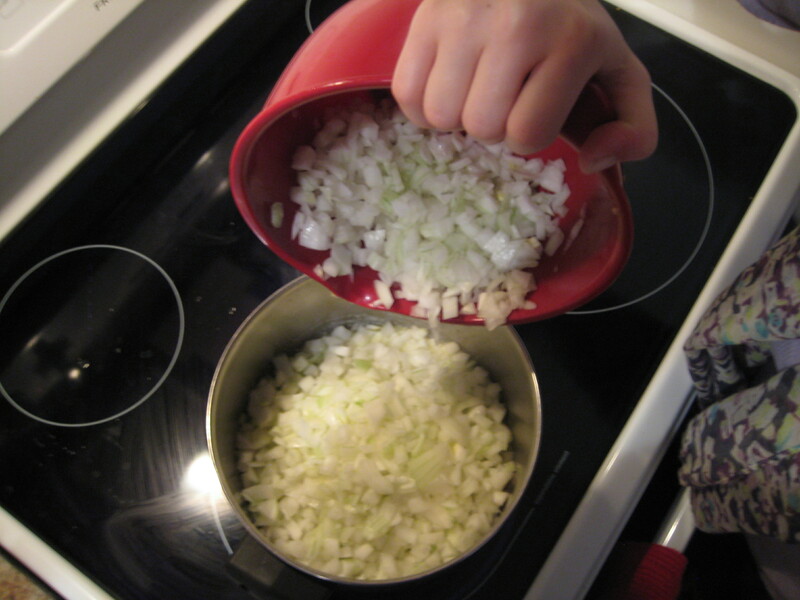 For this recipe you will need 4 medium/large yellow onions. You will also need a good, sharp knife. This is important, because without a good sharp knife this technique does not work. 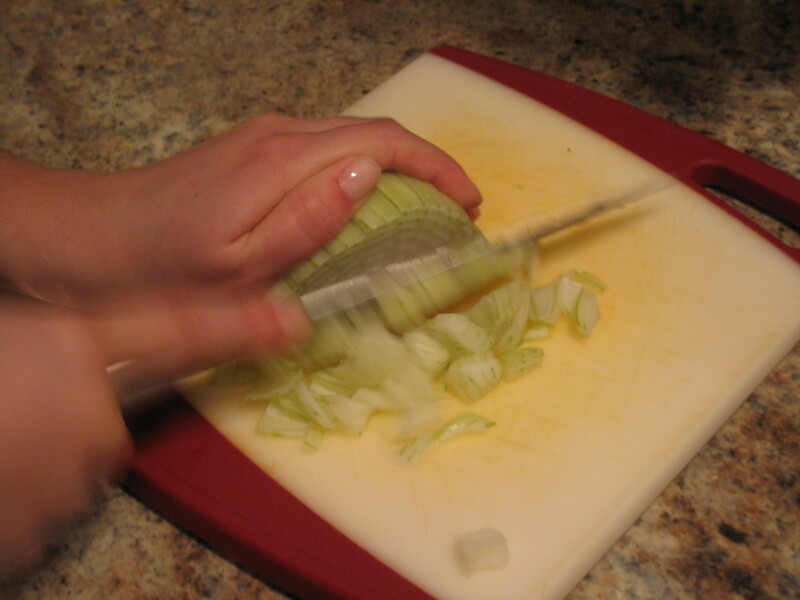 Start off by cutting the top of the onion off. 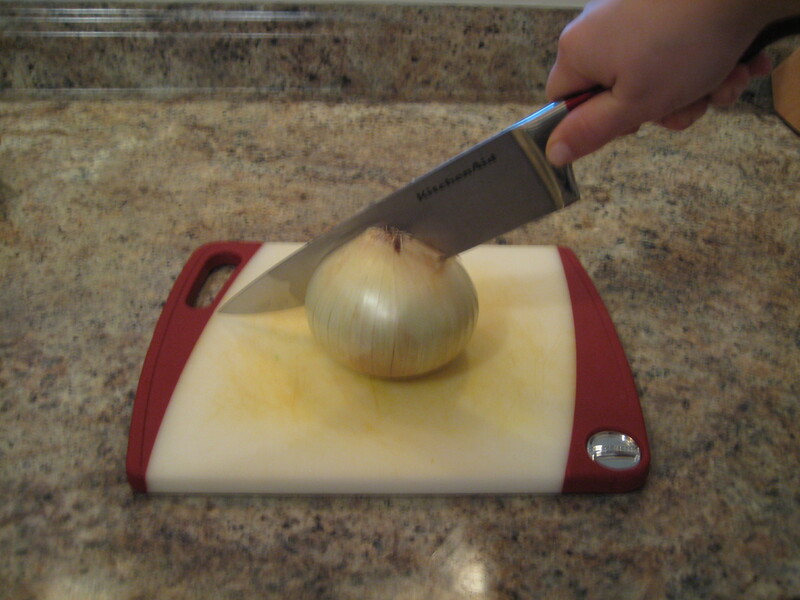 Next, slice the onion in half length-wise. 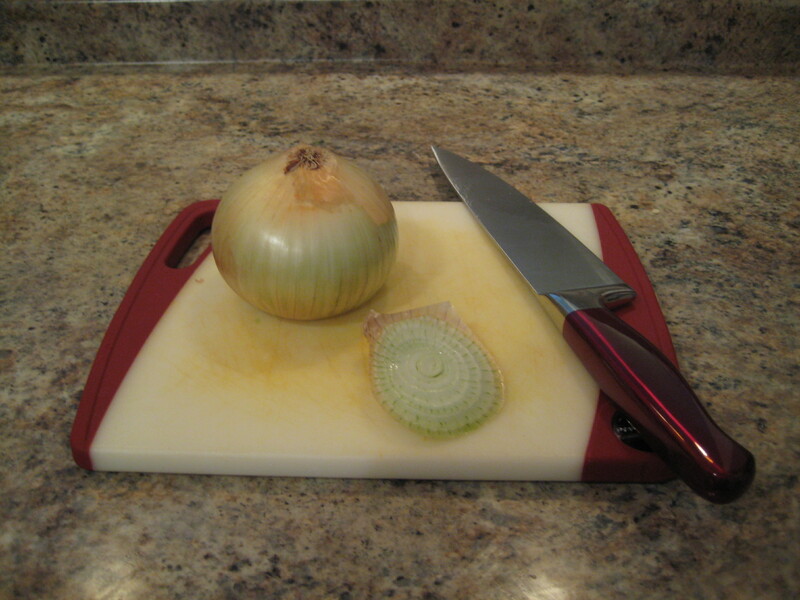 Now place the onion flat on the cutting board, the trick is to make slices in 2 directions without cutting all the way through the root. 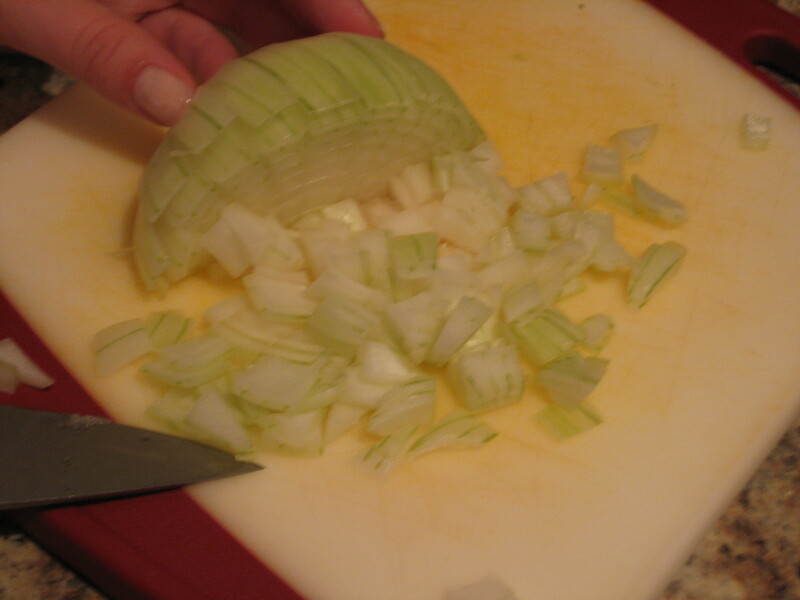 First, cut slices going through the onion vertically, without slicing through the root. 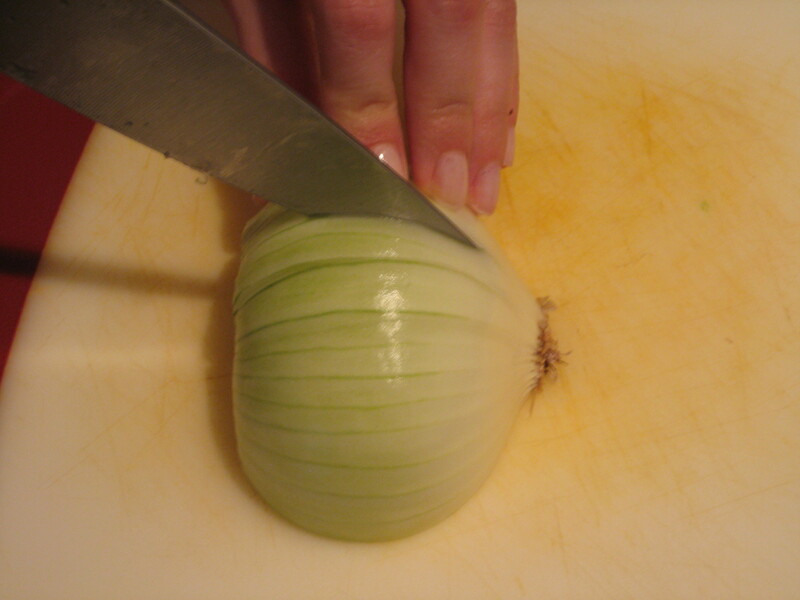 Now make slices through the onion horizontally, also not cutting through the root. Now the onion is ready to be cut up; slice through the onion all the way to the root and small pieces of onion will fall off in tiny bits. Cutting the onions into these thin bits create a great texture, and their size will also aid in the caramalizing process. First we’ll need to carmalize those onion bits to get the most flavor out of them. In a large pot melt the butter over medium heat. 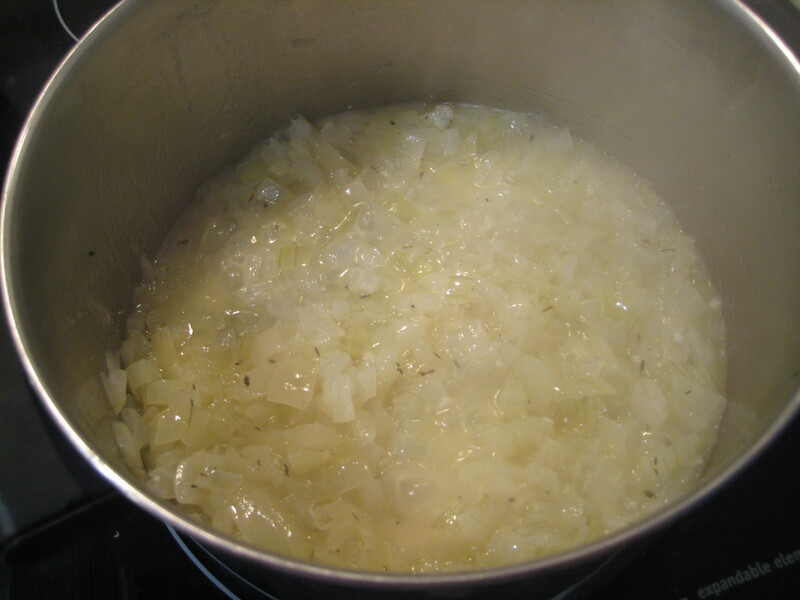 Once the butter is melted add the onions, garlic, bay leaves, thyme, 1 tsp salt, and 1/2 tsp black pepper. I know it looks like a lot, but the onion bits will shrink down to about 1/10 of their size by the time we are finished with them. Cook the onions over medium heat, stirring frequently, for about 20 minutes. At this point the onions will have released a lot of liquid. Increase the heat very slightly and cook until the liquid mostly evaporates and the onions are caramelized on the bottom and sides of the pan. 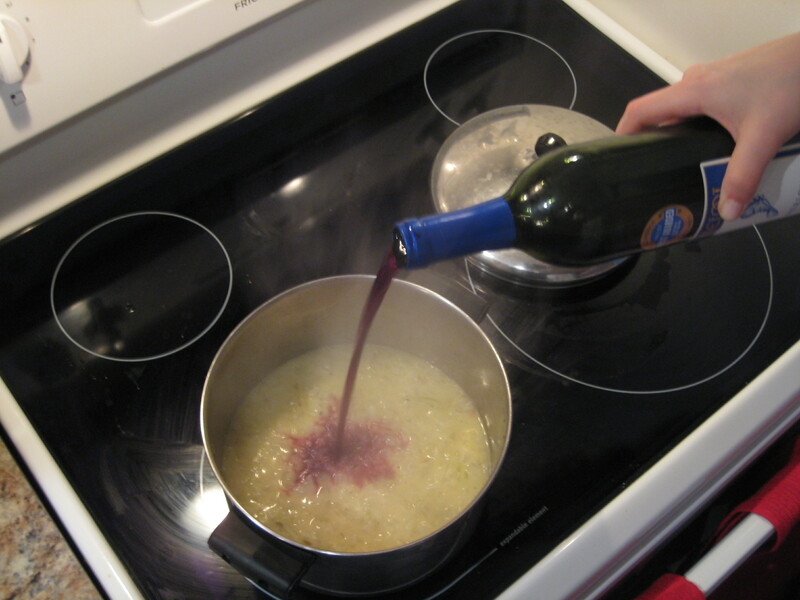 Next add the wine to the pot and bring to a boil. 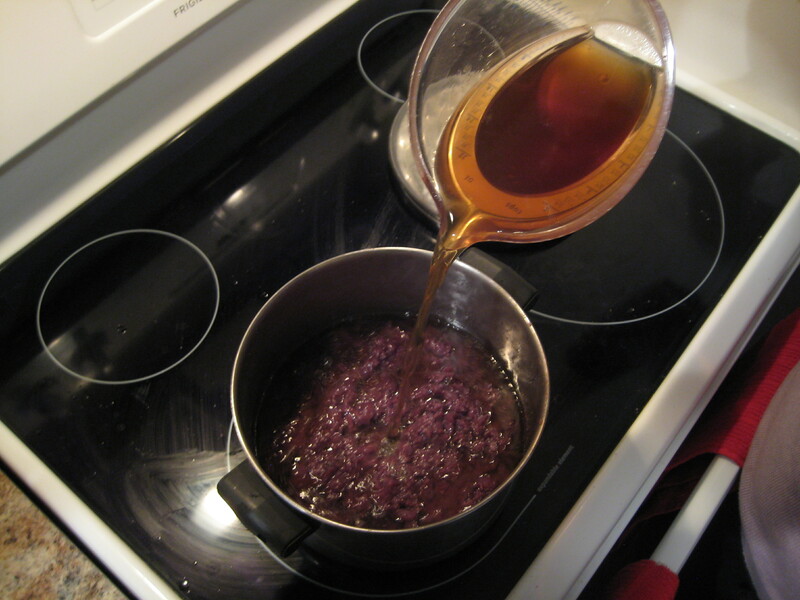 Then, reduce the heat and simmer until the liquid is mostly cooked off (about 20-25 minutes). Remove the bay leaves (and thyme sprigs if using fresh thyme). Reduce the heat to low and sprinkle the flour over the onions and give them a stir. Allow the flour to cook for 10 minutes. Now add the beef broth to the purple onion mixture. Gently scrape the bottom of the pot to remove any yummy brown bits into the soup. Increase the heat to bring to a simmer and cook for 10 minutes. Season with salt and pepper to taste. While the soup is simmering in its final minutes of cooking, it’s time to prepare the croutons. This is really the best part of French Onion Soup, let’s be honest. 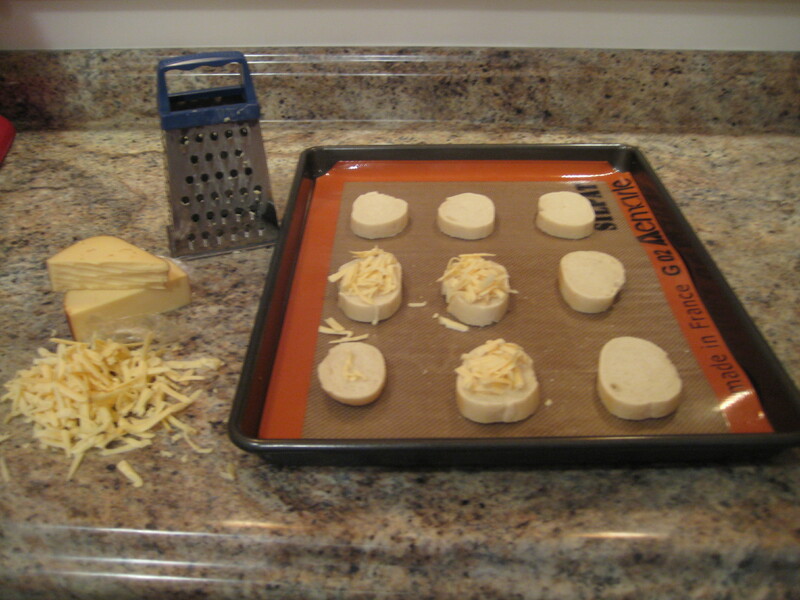 To make the croutons take slices of baguette and arrange on a baking sheet. Sprinkle the slices of bread the grated cheese of your choice and place under the broiler until the cheese is melted and slightly golden brown. Place the croutons on top of the yummy soup and enjoy! In a large pot melt the butter over medium heat. Once the butter is melted add the onions, garlic, bay leaves, thyme, salt, and pepper. Now, add the beef broth to the onion mixture. Gently scrape the bottom of the pot to remove any yummy brown bits into the soup. 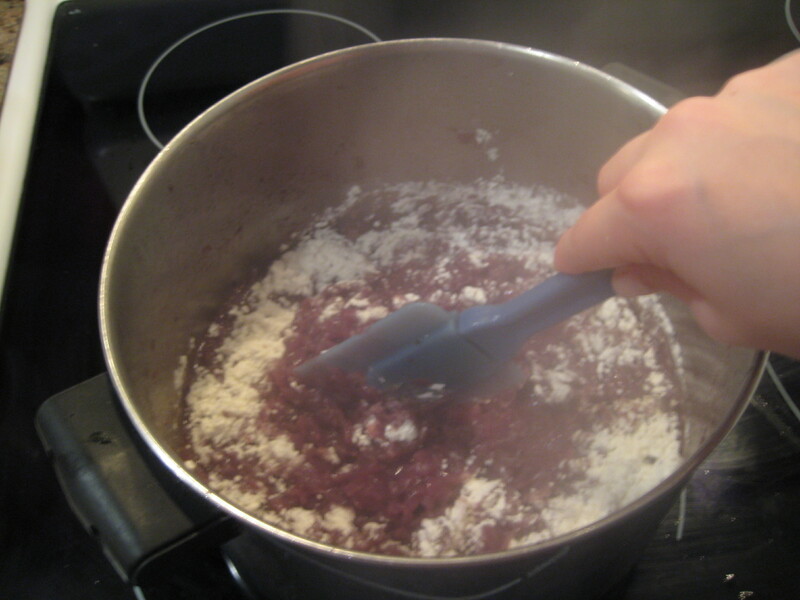 Increase the heat to bring to a simmer and cook for 10 minutes. Season with salt and pepper to taste. To make the croutons take slices of baguette and arrange on a baking sheet. Sprinkle the slices of bread the grated cheese of your choice and place under the broiler until the cheese is melted and slightly golden brown. Serve the soup with 3-4 croutons on top.